"Individuals can achieve so much in a single life, and we should never forget how each of us, everyday, can make a difference to the world around us. That is something that Park and his Pilots knew only too well." Air Chief Marshal Sir Keith Park GCB, KBE, MC*, DFC, DCL, MA, RAF performed so many remarkable roles that it is difficult to do justice to his achievements. A New Zealander, he first served with the Anzac Brigade in Gallipoli. Not content with this, Park transferred to the British Army where he was wounded during the Battle of the Somme and declared “unfit for active service”. He transferred again, this time to the newly-formed Royal Flying Corps in 1916. Flying Bristol fighters he was credited with downing 20 enemy aircraft. During this period he was awarded a Military Cross and Bar, as well as a Distinguished Flying Cross. After the First World War, Park joined the newly-formed Royal Air Force and by 1938 had been appointed as staff officer to Air Chief Marshal Dowding with whom he helped to devise the strategy for Fighter Command that was to win the "Battle of Britain". Dowding trusted Park to implement this strategy and accordingly, in April 1940, placed him in command of 11 Group, which was to defend London and the South East and would therefore bear the brunt of the Battle. While Sir Hugh Dowding controlled the Battle from day to day, it was Keith Park who controlled it hour by hour. Air Vice-Marshal 'Johnnie' Johnson, one of the top Allied air aces of the war, said: "He was the only man who could have lost the war in a day or even an afternoon". Wave after wave of German bombing sorties met with stubborn resistance from the fighter squadrons under Park's command and, by mid-September, it was clear that Britain's defences had held and Hitler was forced to abandon the planned invasion of Britain. 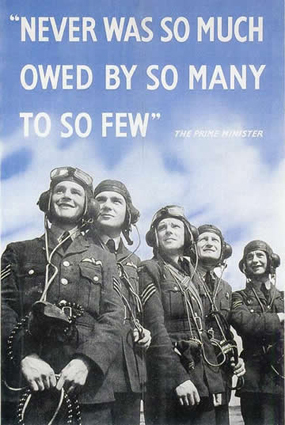 Prime Minister Winston Churchill said "never... was so much owed by so many to so few". It was Keith Park who led "the Few". In July 1942 Park assumed responsibility for the air defence of Malta, the most bombed place on earth, where the population was collectively awarded the George Cross. Here he turned the tide of the battle and again defeated the Luftwaffe. Men of such calibre are not commonplace, and we can all count ourselves fortunate that he was at his post in such dark times, even more so because his journey began on the other side of the world in New Zealand. It was, perhaps, auspicious that his birth place was a town called "Thames". Yet his achievements have been little celebrated and, until 2009, 69 years after the Battle of Britain, he had not been honoured by any public memorial in the country he did so much to defend. Chairman Terry Smith, who launched the Sir Keith Park Memorial Campaign to "right the wrong of an unsung hero", was overwhelmed by the support that the campaign received from so many quarters. It revealed both the extent of the respect engendered by Keith Park and the desire for public acknowledgement of the debt that we owe to him. The Campaign’s aim was to erect a permanent memorial statue to Sir Keith Park in the heart of the capital city he did so much to defend. This was achieved with the erection of first, a temporary statue of Sir Keith Park on the Fourth Plinth in Trafalgar Square for a six-month period, and second, a permanent memorial in Waterloo Place, which was unveiled on 15 September 2010 – the 70th anniversary of the Battle of Britain. Battle of Britain fighter pilot Douglas Bader once said: “The awesome responsibility for this country’s survival rested squarely on Keith Park’s shoulders. British military history of this century has been enriched with the names of great fighting men from New Zealand, of all ranks and in every one of our services. Keith Park's name is carved into history alongside those of his peers." The memorial statue has ensured that Sir Keith Park’s name is now "carved into history" and will serve to educate the young and those visiting London of the incredible sacrifices that were made in that epic struggle in the skies during that summer of 1940. The Sir Keith Park Memorial Campaign unveiled a temporary statue of Sir Keith Park on the iconic Fourth Plinth in London’s Trafalgar Square beneath Nelson’s Column – a memorial to another British hero who defended our nation’s freedom in her hour of need. The statue remained on the Fourth Plinth for six months, after which it was moved to its permanent home as part of the Battle of Britain Exhibition at the Royal Air Force Museum, Hendon. The Sir Keith Park Memorial Campaign unveiled a permanent memorial statue of Sir Keith Park on the 70th Anniversary of the Battle of Britain in Waterloo Place, London. The statue in view of New Zealand House faces the direction that the young pilots who fought in the summer of 1940 would have looked as they went to meet their enemy. "A man of great integrity who inspired all who worked with him. This statue, I hope you will agree, is a fitting permanent memorial in our capital city to a man without whom the history of the Battle of Britain could have been so disastrously different"
– Air Chief Marshal Sir Stephen Dalton KCB ADC BSc FRAeS CCMI RAF, Chief of the Air Staff, on Sir Keith Park at the unveiling of the permanent statue of Sir Keith in Waterloo Place, London. "This statue commemorates Sir Keith Park's personal courage and leadership that is an enduring reminder of the closeness of the deep and enduring relationship between our two countries, a bond that has been shared and forged in a long history of sacrifice"
– The Hon. Dr. Wayne Mapp MP, Minister of Defence for New Zealand, speaking at the unveiling of the permanent statue of Sir Keith in Waterloo Place, London. Terry Smith and the Sir Keith Park Memorial Campaign express condolences on the great loss suffered by the Republic of Poland on the untimely death of President Lech Kaczynski.